Easter is just around the corner and, as the schools close for the holidays this weekend, lots of Ireland's top venue attractions re-open for the season offering Easter egg hunts, arts and crafts, school holiday camps and family days out. If you are looking for something to do, then look no further. Although there are thousands of ideas for things to do on YourDaysOut, we have done the research for you, and listed some of our favourite events and activities from all over the country. A lot of venues and events sell out in advance, so if booking is required, do it early to avoid disappointment. 1. Hatch a plan to go on the Croke Park Stadium Tour this Easter break, from 18-22 April, and take part in an ‘eggs’tra special Egg Hunt! 2. Throw the dice and enter a colourful and creative world of board games in an exhibition from the Victoria and Albert Museum of Childhood, London at The Ark in Temple Bar from 13th April to June 23rd. 3. Included as part of your entry to Epic | The Irish Emigration Museum from 15th to 28th April, you can 'Follow the Púca' trail. Join the trickster Púca on a journey through EPIC Museum by following his paw prints through the galleries and learn about the legend of the Púca and other Easter-themed stories along your way. 4. The National Wax Museum Plus is running a fun Easter promotion with a Bunny Hunt within the National Wax Museum Plus with plenty of bunnies dotted around for all the kids to count! You can also get 15% tickets to the National Wax Museum Plus - including making your very own wax hands! 5. Airfield Estate has an Easter trail through the Estate from the 13th - 28th April. Also, on Sunday 21st April they have an Easter Egg Hunt included in the daily admission. This is on from 10am to 3pm and each participant will receive a DR Coy’s treat at the end. 6. GoQuest | Finglas is an indoor, multi-challenge themed arena for older children, teenagers, and adults. Their custom designed arena has 27 unique challenge rooms for you to try and complete, against the clock during a fun-filled session. Now with another venue in GoQuest | Carrickmines. 7. The National Sports Campus is back with another jam-packed multi-sports camp. Campers will enjoy a range of sports including Athletics, Gymnastics, Trampolining, Basketball, Handball, Badminton, Basketball, indoor soccer and swimming, for only €90 per camper. 8. The annual The Cadbury Easter Hunt for Barnardos will take place again this year in Dublin’s Merrion Square on Friday 19th April and Saturday 20th April. 9. GPO Witness History is a visitor attraction which puts you right inside the GPO during Easter Week in 1916. It a brilliant family day out and especially relevant during the Easter holidays. 10. Kia Ora Mini Farm is open every day and on Easter Bank Holiday Saturday, Sunday and Monday we will have the Easter Bunny, Fireman Sam and the Minions visiting the farm, free glitter tattoos, balloon blasters, wacky races and colouring competitions. 12. Enjoy Easter fun at Wells House with their annual Easter Egg hunt on 21st April, complete with map, Mr. Easter Bunny himself and of course, chocolate! There will also be live music and BBQ on the terrace. Easter Monday is another fun day for all the family with Electric Zoo and a Kid’s Disco on the terrace! 13. Johnstown Castle, currently being developed as a new exciting visitor experience in Wexford, has an Easter Egg Hunt from Saturday 13th to Monday 22nd April, 11am – 4pm, with a choice of mini and mega trails around the garden. 13. Hidden Valley Holiday Park is open each day over the Easter school holidays. All activities are open each day and they will have Easter-related themed games/activities on, as well. Day visitors are welcome between 10am and 4pm. They are also launching Splash Valley Aqua Park which will open on Saturday, May 4th, but maybe over Easter if the weather is good! 14. The Rathwood Easter Train is back from 13th -24th with a fun-filled train ride through Rathwood forest with surprises along the way. 15. Cool Planet Experience are running Easter Bunny-Bot Workshops at 11am and 1pm from April 15th - April 26th. Kids will design and make their own solar-powered Bunny-Bots and learn how these jittery, scribbling bunnies generate electricity from the light! 16. Greenan Maze will be open during the holidays and also have a special Easter Egg Hunt on Easter Saturday, Easter Sunday and Easter Monday. 17. On Easter Sunday 21st and Easter Monday in Powerscourt, you can meet all your favourite farmyard animals as Stonebrook Farm bring lambs, rabbits, chicks, guinea pigs, hamsters, tortoises and a little goat to pet, hold and even bottle feed. 18. Kilruddery House & Gardens host a fun Easter Egg Hunt with children’s arts and crafts organisers Me and the Moon, visit some newborn chicks and baby lambs and win some chocolate treats. 19. Funtasia Water Park in Drogheda is more than just fun and slides. The indoor venue also has a play centre, bowling, mini-golf, zip wires, climbing wall and a high ropes course that will tire out even the most active child. 20. The Leprechaun and Fairy Underground Cavern will have tours at 2pm and 3pm on Easter Saturday, Sunday and Monday and 2pm each day of EasterWeek. The tour takes one hour and is indoors. 21. Red Mountain Open Farm Easter runs from Tuesday 16th of April to Sunday 28th of April daily. There are plenty of activities in their large open barns so regardless of the weather, you’re guaranteed to have a good time! The annual Easter Treasure Hunt is exclusively on Saturday the 20th, Sunday the 21st of April and Monday the 22nd of April. 22. Newgrange Farm is open again and will host an Easter fun weekend including all the fun of the farm and children should bring their Easter Hat/Bonnet and/or Painted Egg with them to enter a special competition. 23. Delta Sensory Gardens host their Easter Eggstravagana on Saturday April 20th with Scavanger Hunt, Arts & Crafts, Cupcake Decorating and more. 24. Bounce into the holidays by taking part in one of the Castlecomer Discover Park's exciting activities, which include Ireland’s longest Zipline, Octagon High Ropes, Canoeing and for those with young children there is the Timber Tumbles Playground, Junior Woodland Course and their popular Easter Family Trail. 25. The Easter Egg Hunt at Nore Valley Park is the place to meet all the new-born spring animals on the farm and earn some sweet treats as you search for hidden eggs. The Easter Egg Hunt runs from the 13th - 19th April from 10am - 4pm daily (except Sunday 14th). 26. Belvedere House Garden & Park Easter Treasure Hunt takes place over the Easter weekend where children complete tasks, enjoy games, meet Mr and Mrs Bunny and enjoy chocolate prizes. 27. Birr Castle Easter Egg Hunt takes place on April 21st, when you can meet with The Easter Bunny who will be joined by Henny Penny, Larry the Lamb, Quackers the Duck and the Mad Hatter. Once you complete the trail you can pick up your Easter Egg from the Mad Hatter…all going well! 29. Clonfert Pet Farm Easter Egg Hunt will take place Thursday 18th to Monday 22nd April, with a fun-filled day out celebrating the opening of their brand new area at the farm and say hello to all our new arrivals along with some very special guests! Tickets are on sale now, and selling fast. 30. Wallaby Woods hosts their popular Scavanger Hunt in April 21st and 22nd where children have to solve the clues to gain your chocolate egg prize. There will also be a full day of fun activities from So Fresh Entertainment as well as a Disco and Bouncy Castles. Tickets on sale now. 31. The Irish National Stud & Gardens are open during Easter with pony rides, face painting, magic shows, craft workshops, a petting zoo and more. 32. Lismore Castle Easter Egg Hunt takes place on Saturday 20th April, with participants using a map to guide them around the gardens, with successful adventurers getting a special chocolate reward. 33. The Quality Hotel, Youghal has a full programme of activities during the Easter break including kids camp, movie nights, discos and egg hunts. 34. Cork City Gaol Easter Bunny Trail will take place from Monday 22nd April until Friday 26th April from 9.30am until 5pm daily.Find all the bunnies and win a prize. 37. Leahy’s Open Farm will be running their annual Leahy's Open Farm EasterEgg Hunt every 20 minutes over Easter Sat, Sun and Mon, for no extra charge. 38. Lifetime Lab Easter Egg Hunt to support Bishopstown Primary Schools takes place on April 19th from 10am - 4pm. A family fun day out is guaranteed as children undertake a treasure hunt to solve clues on the way to finding a secret egg depot. 39. The Tralee Bay Wetland Centre are running fun Easter camps during the holidays featuring Bee Talks, Nature Egg Art, Easter Scavenger Hunt and lots of more great fun! 40. 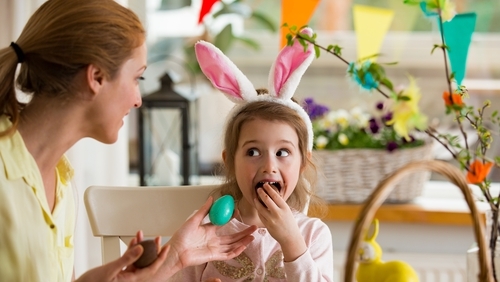 Take part in the Easter Eggtravaganza at Moher Hill Farm, where the Easter Bunny ensures that each child is looked after over the Easter weekend. There will be lots of fun and games for all the family, including face painting, egg and spoon races and the most popular three-legged races. 42. Slieve Aughty Centre Spring Festival in Loughrea runs every day overEaster with loads of fun activities, including the Enchanted Forest, pony rides, playground, go karts, nature hut, arts and crafts room, and the Easter Bunny has left clues to win a treat! 43. Sligo Folk Park hosts an Easter Egg Hunt on 16th, 17th, and 18th of April from 12-3pm. There will be Arts & Crafts workshops, face painting, the Easter Bunny, biscuit decorating, and an Easter Egg Hunt Trail. 45. Tullyboy Farm host their popular Easter event on Easter Sunday and Easter Monday from 12pm. Activities during the day include Egg Hunts, Trailer Rides, Animal Shows and Feeding Time with Farmer Matt. 46. Glendeer Pet Farm are running their popular Easter Egg Hunts on Easter Saturday, Sunday and Monday at 3pm. 47. Tearaways Pet Farm & Activity Centre will be open daily during the holidays from Friday 12th April to Sunday 28th April from 11am - 6pm. 49. Easter Egg painting and an Easter Egg Hunt will take place on EasterSaturday, 20th of April from 1pm - 3pm at the Atlantic Apartotel in Bundoran. 50. The Ulster American Folk Park are having their EasterCelebration from 21st to 23rd of April with stallholders, shopkeepers, travelling journeymen and a host of characters entertaining you as you stroll down Ulster Street. Enjoy traditional crafts, storytelling sessions, taste seasonal treats, giggle at Punch & Judy, have a go at egg & spoon races and horse and cart rides. YourDaysOut is a sales and marketing platform for local businesses and event organisers with tools to help promote, publish and sell tickets and bookings online, for up to 50% less than other ticket sites. It is also No.1 in Ireland for people looking for things to do, where users can FOLLOW their favourite pages, get notifications about any discount deals or Easter events in Ireland.